The Chief Science Officer (CSO) program seeks to enhance the workforce and employability skills of student CSOs and their peers; cultivate a pipeline of diverse STEM leaders prepared for college, careers, and civic engagement; and increase the engagement of STEM professionals, higher education, and community organizations with K-12 schools as both partners and mentors. CSOs champion communication of, and interest and engagement in STEM (STEAM when you include the arts) and innovation on and off campus. Programming includes leadership training and planning STEM engagement opportunities to ensure these opportunities reflect their peers’ interests. They also streamline schools’ connection to local businesses and industry, higher education, and STEM professionals and organizations, working with these entities to offer their peers and community members hands-on experiences that build STEM awareness and important workforce skills. 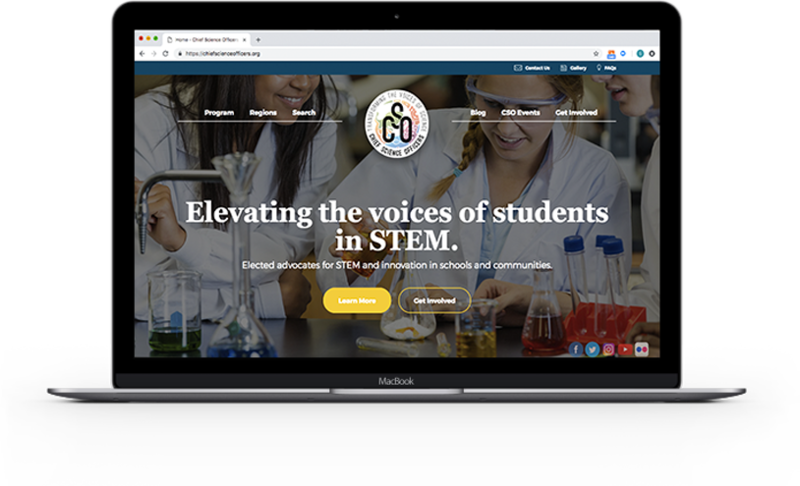 Collaboratively, CSOs function as a unified “cabinet,” engaging in local, state, and national STEM conversations to change the perception of STEM at the local, state and national levels; transform school and community culture; and broaden participation for all students and community members. Visit the CSO Website at ChiefScienceOfficers.org. Launched in the fall of 2015, the initial cohort included 78 Arizona schools and 138 CSOs. Today, the 2019-2020 cohort consists of 720 CSOs in three countries with new programs being launched every year. Together, they reach more than 100,000 peers and community members, and engage with 300+ partners and mentors. These CSOs come from every walk of life. For example, 68% of Arizona CSOs come from Title I schools, including 180 female CSOs (50%); 97 Caucasian (27%): 78 Hispanic/Latino/Spanish (22%); 30 Asian (8%); 12 Black or African American (3%); 4 American Indian or Alaska Native (1%); 15 mixed minority (4%); 124 not defined (35%).